The SRC Recovery Leggings provide you with the support to move more freely post-delivery and make lifting, feeding, bathing and caring for your baby much easier. Regain your pre-baby body shape? Recovery from C-section or perineal trauma ? Abdominal Muscle Separation (Diastasis Rectus Abdominus Muscle DRAM)? SRC Recovery Leggings have been specifically designed to activate muscles they are in contact with. Gentle continuous compression is key so as not to tire your muscle over time. Graduated gentle leg compression promotes good venous return. Continuous gentle compression to the abdomen, perineum and back activate muscle and stimulate venous return which helps reduce fluid in those areas. Constant gentle compression to any wound either C-Section or perineal decreased swelling which in turn decreases pain. Why would a health care professional recommend them? SRC Recovery Leggings have all the same attributes of the SRC Recovery Shorts but with an extended leg length to the ankle. SRC Recovery Shorts were designed in consultation with a leading obstetrician/gynaecologist Dr. Grant Saffer. The compression garment can be worn to comfort from day 1 after both a vaginal or C-section delivery. We recommend wearing these for 8-10 week or as long as you feel the need. All SRC compression products feature superior fabrics which are specially milled and rigorously tested before any product is manufactured. Our fabrics therefore are of superior quality and deliver sustained compression over time. Start wearing your SRC Recovery Leggings as soon as you feel able post delivery. Shoud they feel uncomfortable due to fluid retention please remove them and try again the following day. Please be advised that if you have had stitches to the perineal area following a vaginal delivery you should change your maternity pad every 2 hours. DO NOT wear a pad that has a plastic backing. This may cause the area to sweat which will increase the risk of infection. Wash the area with salt water and dry well following each pad change. Wear your recovery leggings during the day only while your perineal stitches are healing. Once the area is fully healed you can wear them both day and night. Your Leggings can be worn 24 hours. The longer you wear them over a 24 hour period the more activation your muscles will receive. Truly more comfortable than pyjamas, SRC Leggings are especially useful to wear to bed. They provide the necessary support to minimize the effects of pelvic pain during sleep. *Please note: SRC leggings have a gentle level of graduated compression in the legs. These are suitable for women with mild varicose veins or swelling. This product will not provide enough compression for moderate or severe varicose veins of the legs. Women often complain that wearing a grade 2 or 3 compression stocking for long periods can be difficult due to them becoming hot and tight. The SRC Leggings were designed with a specific level of compression so that women can wear their compression stockings under the SRC Leggings for a number of hours during the day. Once the compression stockings have been removed the SRC Leggings will continue to provide mild graduated compression so the benefit of having worn the stockings is not lost. Measure in your underwear only. Stand with your heels together and keep the measuring tape straight. Place the tape over your hips, pubic bone and bottom at the fullest part. The tape should touch your body at all points but not be pulled tight. 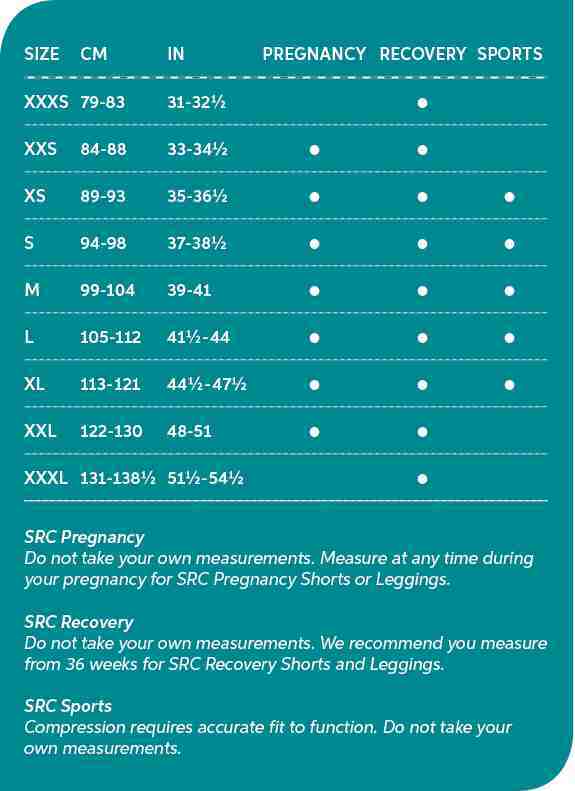 We advise you measure and order your SRC Pregnancy Shorts and Leggings during the 12-15 week of pregnancy or when you begin to feel discomfort and pain or as advised by your healthcare practitioner.